Viral infections alter host cell homeostasis and this may lead to immune evasion and/or interfere with the replication of other microbes in coinfected hosts. Two flaviviruses are associated with a reduction in HIV replication or improved survival in HIV-infected people (dengue virus (DV) and GB virus type C (GBV-C)). GBV-C infection and expression of the GBV-C nonstructural protein 5A (NS5A) and the DV NS5 protein in CD4+ T cells inhibit HIV replication in vitro. To determine whether the inhibitory effect on HIV replication is conserved among other flaviviruses and to characterize mechanism(s) of HIV inhibition, the NS5 proteins of GBV-C, DV, hepatitis C virus, West Nile virus, and yellow fever virus (YFV; vaccine strain 17D) were expressed in CD4+ T cells. All NS5 proteins inhibited HIV replication. This correlated with decreased steady-state CD4 mRNA levels and reduced cell surface CD4 protein expression. Infection of CD4+ T cells and macrophages with YFV (17D vaccine strain) also inhibited HIV replication and decreased CD4 gene expression. In contrast, mumps virus was not inhibited by the expression of flavivirus NS5 protein or by YFV infection, and mumps infection did not alter CD4 mRNA or protein levels. In summary, CD4 gene expression is decreased by all human flavivirus NS5 proteins studied. CD4 regulation by flaviviruses may interfere with innate and adaptive immunity and contribute to in vitro HIV replication inhibition. Characterization of the mechanisms by which flaviviruses regulate CD4 expression may lead to novel therapeutic strategies for HIV and immunological diseases. Based on phylogenetic relationships of viral RNA-dependent, RNA polymerase sequences, the family Flaviviridae is comprised of three genera and a few unclassified viruses that include important animal and human pathogens (Fig. 1⇓A and reviewed in Ref. 11). Although most of these viruses cause transient, self-limited infection, two may result in persistent human infection (hepatitis C virus (HCV)3 and GB virus type C (GBV-C)). Members of the Flaviviridae contain a single-stranded, positive sense RNA genome encoding a polyprotein that is posttranslationally cleaved into structural and nonstructural proteins. Although flaviviruses are generally similar in their genome structure and replication strategies, a few important differences exist (2, 3, 4). For example, the nonstructural protein 5 (NS5) of pestiviruses, hepaciviruses, and the GB viruses are processed into two products termed NS5A and NS5B. NS5A is a multifunctional phosphoprotein required for infectivity and RNA replication, and NS5B contains polymerase activity (reviewed in Ref. 5). In contrast, the NS5 proteins of members of the flavivirus genus are not processed and retain polymerase activity (2). Phylogenetic relationships of the RNA-dependent, RNA polymerase sequences of the family Flaviviridae. Representative isolates of viruses within the three genera (flavivirus, pestivirus, and hepacivirus) of the Flaviviridae and the unassigned GB viruses are shown in A. Viruses analyzed included the vaccine strain (17D) of YFV, DV serotype 2, and WNV, classical swine fever virus (CSFV), bovine viral diarrhea virus (BVDV), six genotypes of HCV, GB virus A (GBV-A), GB virus B (GBV-B) and the human (hum) and chimpanzee (trog) variants of GBV-C. 0.2 = distance representing 0.2 aa substitutions per position. B illustrates the NS5 protein coding sequences used to generate stably expressing Jurkat cell lines. These encode the complete NS5A proteins of GBV-C and HCV and the complete NS5 proteins of DV (serotype 2), WNV, and the YFV(17D). Additional cell lines expressing a 16-aa GBV-C NS5A peptide (aa 152–167), the same 16-aa in a Scr, HCV DI (encoding aa 1–215) and a control cell line contains the GBV-C NS5A sequence that normally encodes aa 126–236 but in which a FS mutation was inserted (126–236 FS) are also shown. GBV-C is a common human virus with no known disease manifestations (3, 6). Several studies found an association between GBV-C viremia and prolonged survival in HIV-infected people (Refs. 7, 8, 9, 10, 11, 12 and reviewed in Refs. 3 and 13). GBV-C replicates in B and T lymphocytes including CD4+ T cells (14, 15, 16), and coinfection of lymphocytes with GBV-C and HIV results in potent inhibition of both CCR5- and CXCR4-tropic HIV isolates, including isolates representing clades A through H and group O (17, 18, 19). Acute dengue virus (DV) infection is also associated with transient suppression of serum HIV RNA levels and acute, but not convalescent sera inhibits HIV replication in vitro, suggesting viral interference (20). Two GBV-C proteins have been shown to interact with CD4+ T cells and inhibit HIV replication in vitro. Expression of the viral envelope glycoprotein E2 within CD4 cells or addition of recombinant soluble E2 to CD4+ T cells decreases surface expression of CCR5, one of the two major HIV coreceptors, and induces the release of soluble factors that inhibit HIV entry in vitro (18, 21, 22). Expression of the GBV-C nonstructural protein NS5A protein in CD4+ T cells also inhibits replication of HIV isolates representing three different clades, independent of entry coreceptor tropism (CCR5 or CXCR4) (23, 24). Both clinical and laboratory-adapted HIV isolates are inhibited (17, 23, 24, 25). A 16-aa peptide region within GBV-C NS5A is sufficient for HIV inhibition and HIV replication is inhibited in cells incubated in synthetic peptides containing this domain, suggesting that this molecule has therapeutic potential (25). GBV-C NS5A mediates HIV inhibition in part by decreasing the surface expression of CXCR4, the other major HIV coreceptor, and by inducing release of stromal cell-derived factor 1 (SDF-1; CXCL12), the chemokine ligand for CXCR4 (23, 26). Although GBV-C-mediated chemokine modulation contributes to HIV replication inhibition, neutralization of SDF-1 did not abolish the inhibition, suggesting that the GBV-C NS5A protein has additional mechanisms by which it inhibits HIV replication (23, 26). Expression of DV (serotype 2) NS5 protein in CD4+ T cells also inhibits HIV replication and modulates CXCR4 and SDF-1 expression (26). To determine whether HIV inhibition induced by flavivirus NS5 protein expression is conserved among additional members of the Flaviviridae, we characterized the effect of NS5 protein expression of five members of the virus family in CD4+ T cells. In addition, we examined yellow fever virus (YFV) infection (17D vaccine strain) of T lymphocytes and macrophages to determine whether the effects of NS5 protein expression were recapitulated during viral replication. These studies identify a mechanism by which flavivirus NS5 protein modulates T cell homeostasis and that may contribute to HIV replication inhibition. Viral NS5 protein coding sequences were ligated into a modified pTRE2-Hyg plasmid (BD Clontech) as previously described (23). This plasmid generates a bicistronic message encoding the viral sequence upstream of the encephalomyocarditis virus (EMC) internal ribosomal entry site (IRES) element that directs translation of GFP (23). Jurkat (tet-off) cell lines that stably expressed the various flavivirus NS5 protein sequences were generated following transfection and selection (23, 25). NS5 inserts and control sequences were confirmed by sequencing plasmid DNA (25) (University of Iowa DNA Core Facility; Applied Biosystems automated DNA sequencer 373A). Protein expression was demonstrated by immunoblot analysis using rabbit anti-GBV-C NS5A serum, murine anti-HCV NS5A mAb (BioDesign), or a goat polyclonal anti-gp120 mAb (Abcam) (23, 27). For cell lines expressing NS5 peptides for which no Abs are available, GFP expression was demonstrated by flow cytometry and total cellular DNA and RNA were examined for linkage between NS5A sequences and GFP using PCR or RT-PCR followed by determination of the nucleotide sequence as described previously (23, 25). HIV infection of CD4+ T cell lines utilized an X4 HIV-1 isolate (clade B, catalog no. 1073; National Institutes of Health AIDS Research and Reference Reagent Program), and infection of primary human PBMCs and monocyte-derived macrophages (MDMs) utilized this X4 isolate or an R5 isolate (clade A; catalog no. 1741) (17, 23). MDMs were prepared as previously described (28) and were infected with R5-tropic HIV 3 days after differentiation (average 10 days in culture). HIV replication was determined by measuring HIV p24 Ag in culture supernatants by ELISA as previously described (10, 17). Data presented represent the mean of a minimum of six independent infections, and error bars represent the SEM. YFV (17D) and mumps (Jeryl-Lyn) vaccine strain isolates were propagated in BHK 21 and Vero cells, respectively (29, 30), and the infectious titers were determined by terminal dilution (31). YFV and mumps virus infections were also conducted in CD4+ T cell lines, PBMCs, and MDMs. MDM infections were initiated 2 days after differentiation (average, 9 days). PBMCs and MDMs were obtained from healthy HIV and HCV Ab-negative donors after obtaining written informed consent as described elsewhere (17). All subjects who donated blood samples provided written informed consent, and this project was approved by the University of Iowa Institutional Review Board. Total cellular RNA from a minimum of three independent Jurkat cell line cultures was purified (RNeasy kit; Qiagen) and cDNA was synthesized (ReactionReady cDNA synthesis kit; SuperArray Bioscience). RNA concentrations were determined by real-time RT-PCR as recommended by the manufacturer (SuperArray Bioscience). Fold change mRNA between experimental and vector control (VC) cells was determined using the ΔΔCt method normalized to the average expression of five housekeeping genes in vector control cells (β-actin, ribosomal protein L13a, hypoxanthine phosphoribosyl transferase 1, glyceraldehyde-3-phosphate dehydrogenase, 18S ribosomal RNA) as described by the manufacturer (SuperArray Bioscience Corp). Cell surface receptor protein expression was determined by flow cytometry (FACScan; BD Biosciences) as described previously (10). Nucleotide sequence alignments and predicted protein secondary structure analyses utilized DNAMan software (Lynnen Biosoft) and a web-based sequence analysis program, Mega 3.1 (32). RNA-dependent, RNA polymerase amino acid sequences from representative flaviviruses were aligned as described by Koonin (33). Phylogenetic relationships were constructed using the neighbor-joining method and trees were generated by Mega 3.1 software (32). The viruses used to construct the tree included pestiviruses (bovine viral diarrhea disease virus (GenBank http://www.ncbi.nlm.nih.gov/sites/entrez, accession no. U18059, and classical swine fever virus (NC_002657)), flaviviruses (YFV vaccine strain 17D (X03700), DV (AF359579), and West Nile virus (WNV) strain NY99 (NC_009942)), hepaciviruses (HCV genotypes (GT) GT 1 (M62321), JFH-1 strain GT2 (AB047639), GT 3 (D17762), GT 4 (Y11604), GT 5 (Y13184), GT 6 (Y12083)), and the unassigned GB viruses (GBV-A (HGU94421), GBV-B (NC001655), a human isolate of GBV-C (AF121950), and a chimpanzee (troglodyte) GBV-C variant (AF070476)). Statistics were performed using SigmaStat software version 3.11 (Jandel Scientific) and SuperArray statistical software. The t tests were used for direct comparisons of HIV p24 Ag release or mumps virus infectious titer, and χ2 analysis was used for cell surface expression measured by flow cytometry. ANOVA was used for multiple comparisons. CD4+ Jurkat T cell lines were previously generated that stably express the DV (serotype 2) NS5 protein, the GBV-C full-length NS5A protein, a peptide domain of GBV-C NS5A (aa 152–167), and control cell lines including the VC, GBV-C NS5A 152–167 in a scrambled order (Scr), and a GBV-C NS5A construct in which a frameshift (FS) was introduced (126–236 FS) containing the NS5A RNA but that expresses a 26-aa missense protein (23, 25, 26). In addition, new Jurkat cell lines were generated that expressed full-length HCV NS5A, the first 215 aa of HCV NS5A (structural domain I (DI)), and the full-length NS5 proteins WNV and YFV (vaccine strain 17D) using the same bicistronic expression plasmid expressing GFP as a reporter as described and illustrated in Fig. 1⇑B (23). GFP expression in these cell lines is shown in Fig. 2⇓A. Cells expressing viral NS5 proteins had lower levels of GFP than did cells expressing peptide fragments or the VC, consistent with previous studies showing that expression levels of downstream open reading frames is inversely related to the size of the upstream open reading frame in bicistronic vectors (34). 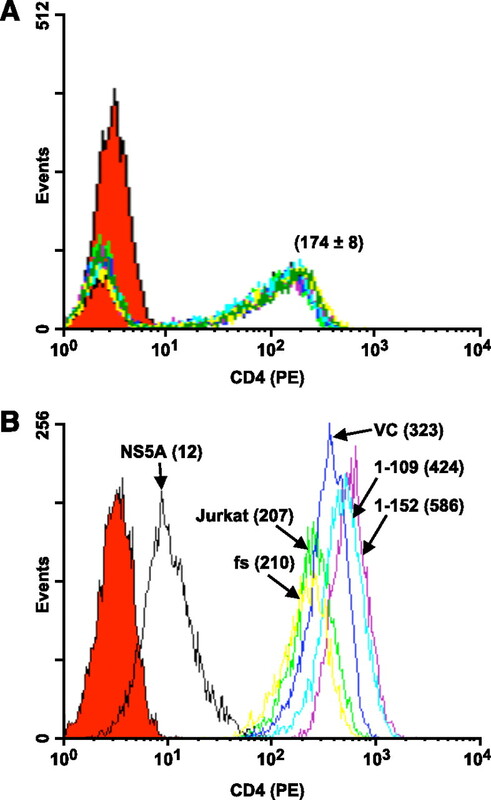 For the two NS5A proteins for which specific Abs are available (GBV-C and HCV), full-length protein was detected in the Jurkat cell lysates by immunoblot (Fig. 2⇓B). No commercial Abs for DV, WNV, or YFV NS5 proteins, the GBV-C NS5A 152–167 peptide, or HCV DI are available. To further characterize the cell lines expressing these proteins (in addition to GFP expression), cellular DNA and RNA for each cell line was extracted and amplified by both PCR and RT-PCR, respectively. Amplicons included the CMV promoter, the NS5 sequences, and part of the EMC IRES as previously described (25). The linkages between the CMV promoter, Kozak sequences, NS5 coding sequences and the EMC IRES, and GFP were confirmed by sequencing. For the RNA extractions, specificity was confirmed as no amplification occurred in the absence of reverse transcriptase. Generation of CD4+ T cell lines (Jurkat) expressing flavivirus NS5 proteins. Jurkat cell lines were transfected with the flavivirus NS5 encoding plasmids and following selection in hygromycin, GFP levels were determined by flow cytometry (A). Jurkat, Parental cells without transfection; GBV-C, GBV-C NS5A protein; 152–167, the GBV-C 16-aa peptide; Scr, the scrambled GBV-C peptide; HCV, HCV NS5A protein; DI, HCV DI; DV, DV NS5 protein; YFV, YFV vaccine strain NS5 protein; and WNV, WNV NS5 protein. ∗, GFP MFI was less than VC, FS, and Scr (p < 0.001; t test). †, GFP expression was significantly less than VC and FS controls, but not Scr. GFP expression in all cells compared with parental Jurkat cells (p < 0.001; A). GBV-C and HCV NS5A protein expression was demonstrated in Jurkat cell lysates by immunoblot analysis (B) using rabbit anti-GBV-C NS5A Ab (left panel) or a murine anti-HCV NS5A Ab (right panel). pep, GBV-C 152–167. HIV replication was inhibited in Jurkat cells expressing the full-length NS5A proteins of HCV and GBV-C and also by the full-length NS5 proteins of DV, WNV, and YFV compared with VC cells (Fig. 3⇓, A and B). Confirming previous studies, expression aa 152–167 of GBV-C NS5A was sufficient for HIV inhibition, whereas the scrambled peptide or the FS GBV-C RNA sequence controls did not inhibit HIV (25). The GBV-C 152–167 peptide lies within the GBV-C region that shares overall homology with the structural DI of HCV NS5A (35), although only 3 of the 16 aa in the peptide region are identical. Despite the amino acid differences, HIV replication was inhibited in Jurkat cells expressing HCV DI (Fig. 3⇓, A and B; data represent difference in percent reduction in three independent experiments). The NS5 proteins of Flaviviridae inhibit HIV but not mumps virus in Jurkat cells. HIV replication 4 days after infection was significantly reduced in Jurkat cell lines selected for expression of full-length GBV-C and HCV NS5A proteins, GBV-C NS5A aa 152–167 (152–167), HCV DI, and NS5 proteins of DV serotype 2, WNV, and YFV NS5 proteins compared with three control cell lines: VC, GBV-C NS5A FS sequences, and GBV-C NS5A aa 152–167 in a Scr (A). HIV p24 Ag released into culture supernatants was below the limit of detection in all cell lines except the three control cell lines (VC, FS, Scr). The value shown (5 pg/ml) is one-half the lower limit of detection (10 pg/ml) and the p value was <0.001 for all seven cell lines compared with each of the three control cell lines. The kinetics of HIV replication in the cell lines is shown in B. HIV replication was significantly higher in the three control cell lines (VC, FS, Scr) compared with the NS5-expressing cell lines on days 3 and thereafter (B; p < 0.001 on each day for all). Mumps virus replication in these Jurkat cell lines was not reduced in any of the NS5A-expressing cell lines compared with the VC or FS, respectively, 4 days after infection (C). HIV inhibition did not appear to be due to cytotoxicity. Although expression of the flavivirus NS5 proteins appeared to slow the doubling time of Jurkat cells, the density of viable cells was not different between the different cell lines and the parent Jurkat cell line following 6 days in culture, and the amount of HIV p24 Ag released into culture supernatants per cell illustrates that HIV inhibition does not correlate with the number of viable cells in the different cell lines (supplemental Fig. 1).4 Previous studies of demonstrated that vesicular stomatitis virus glycoprotein pseudotyped HIV particles were not inhibited by expression of GBV-C NS5A protein or peptides containing the 152–167 region, indicating that the inhibition is specific for HIV envelope glycoproteins (25). In addition, mumps virus (Jerl-Lyn vaccine strain) replicated as well in Jurkat cell lines expressing flavivirus NS5 proteins as it did in the VC cell lines (Fig. 3⇑C). Thus, the antiviral effect of NS5 proteins was not indiscriminant. Taken together, these data indicate that expression of the NS5 protein from all three genera within the Flaviviridae and from the unassigned GB virus group potently inhibited HIV replication in a CD4+ T cell line. To determine potential mechanisms by which NS5 protein expression might inhibit HIV replication, expression of the HIV entry receptors and their natural ligands was examined in Jurkat cells expressing the flavivirus NS5 proteins. Consistent with previous studies, none of the Jurkat cell lines had detectable CCR5, RANTES (CCL5), MIP-1α (CCL3), or MIP-1β (CCL4) mRNA (23), and CXCR4 mRNA expression was reduced in GBV-C-expressing cells compared with VC cells (−1.32-fold, t test; p = 0.049). However, CXCR4 mRNA reduction was not statistically different from VC for either HCV or YFV NS5-expressing cells (data not shown). In contrast, steady-state CD4 mRNA levels were significantly reduced in all seven of the cell lines expressing the full-length NS5 proteins and in the cell line expressing GBV-C NS5A aa 152–167 and the HCV DI compared with the three control cell lines (Fig. 4⇓A). The effect was most pronounced in the cells expressing the GBV-C NS5A protein (85-fold lower than VC; p < 0.0001). The serine at position 158 of the GBV-C NS5A is predicted to be phosphorylated, and we found that mutation of this serine to a phosphomimetic amino acid (glutamic acid) did not effect the HIV inhibition. However, substitution of either alanine or glycine significantly decreased HIV inhibition compared with the parent, although the effect was not abrogated (25). These data suggest that the structure and/or phosphorylation of this peptide is critical for the effect on HIV replication (25). Jurkat cells expressing these mutant peptides (S158E, S158A, and S158G) were examined for CD4 expression and consistent with the HIV inhibitory effect, CD4 down-regulation in cells expressing the S158E mutant was similar to the parent peptide. CD4 expression on cells expressing the S158A and S158G mutants was significantly higher than the parent peptide or the S158E mutant (supplemental Fig. 2), and CD4 down-regulation was significantly less than control Jurkat cells (supplemental Fig. 2). Flaviviridae NS5 proteins decrease CD4 expression. Steady-state mRNA levels for CD4 were significantly reduced in Jurkat cells expressing the GBV-C, HCV, DV serotype 2, WNV, YFV 17D vaccine strain NS5 proteins, and the GBV-C peptide (aa 152–167) compared with cells containing the VC (A; ∗, p < 0.03 for all). CD4 mRNA expression was not altered in Jurkat cells containing the GBV-C NS5A FS or scrambled 152–167 GBV-C peptide sequence (Scr) compared with VC (A). Cell surface CD4 levels (MFI) were significantly reduced in the same cells in which mRNA levels were reduced (B; ∗, p < 0.001). Consistent with the reduction in CD4 mRNA levels, CD4 receptor surface expression was significantly reduced on Jurkat cell lines expressing full-length flavivirus NS5 proteins, the GBV-C NS5A aa 152–167 peptide, and HCV DI compared with the three control cell lines (Fig. 4⇑B). Total cellular CD4 was also reduced by NS5 protein expression as determined by immunoblot analysis, indicating that the down-regulation was not due to impaired receptor cycling (data not shown). The finding that CD4 expression was reduced by GBV-C NS5A was unexpected, as we did not observe this in a previous study (23). Upon reviewing the CD4 expression data related to GBV-C NS5A expression, we confirmed that the cells examined in that study had no change in CD4 expression compared with control cells (Fig. 5⇓A). However, these cells had been passed in cell culture >40 times and a later passage of these same cells had been frozen in liquid nitrogen. The late passage cells were thawed and re-evaluated on two separate occasions. These high passage cell lines no longer expressed NS5A protein and in these the surface expression of CD4 was not different from that of controls (Fig. 5⇓A). To further assess this, Jurkat cells frozen at an earlier passage were also thawed and examined for CD4 expression by flow cytometry. These cells expressed GBV-C NS5A protein by immunoblot analysis, and CD4 surface expression was significantly lower than that of control cells (Fig. 5⇓B; p < 0.001, t test comparing CD4 mean fluorescent intensity (MFI) on NS5A-expressing cells with VC cells). The reasons for loss of GBV-C NS5A expression in the one cell line are unclear, but subsequently we have examined cells maintained in culture for >50 passages and NS5A expression was maintained. GBV-C NS5A expression is required for CD4 modulation. A illustrates CD4 surface expression on Jurkat cells stably transfected with the VC (green), two late passes of a cell line (light blue and yellow) GBV-C NS5A, FS (black), and Jurkat cells without any transfection (purple). Cells previously shown to express GBV-C NS5A had been passed >40 times before measuring CD4 expression and NS5A was no longer detected in these cells. Mean CD4 fluorescent intensity is shown in parentheses (all five cell lines were within 8 of 174). B illustrates CD4 expression from low passage Jurkat cells (<15 passages) expressing GBV-C NS5A (black) compared with Jurkat cells with the VC, NS5A 1–152, 1–109, FS, or nontransfected Jurkat cells (dark blue, purple, light blue, green, and yellow, respectively). Jurkat cells incubated with isotype control are shown in red. CD4 surface expression was significantly lower in the GBV-C NS5A-expressing cells compared with all of the control cell lines. Mean CD4 fluorescence intensity is shown in parentheses. CD4 mRNA down-regulation did not occur as a result of global transcriptional inhibition, as the CD4 mRNA levels in the Jurkat cells expressing the GBV-C FS and scrambled NS5A peptide were not significantly different from those of VC cells, and several mRNAs highly expressed in Jurkat cells (CREBBP, CXCR3, MAPK8, TLR6) were the same in the NS5-expressing cells compared with the VC. In addition, NS5A expression did not decrease the expression of all cell surface receptors. For example, CD81 surface expression was not altered in Jurkat cells expressing GBV-C or HCV NS5A compared with the VC or FS (Fig. 6⇓A and data not shown). To determine whether NS5A down-regulated CD4 in primary human CD4 cells, transient expression of GBV-C and HCV NS5A demonstrated that CD4 surface expression was reduced compared with the FS control-transfected cells (Fig. 6⇓B). Similar to that observed in previous studies, CXCR4 was down-regulated by NS5 protein (supplemental Fig. 3A), and CCR5 was not detected on any of the Jurkat cell lines studied (data not shown). 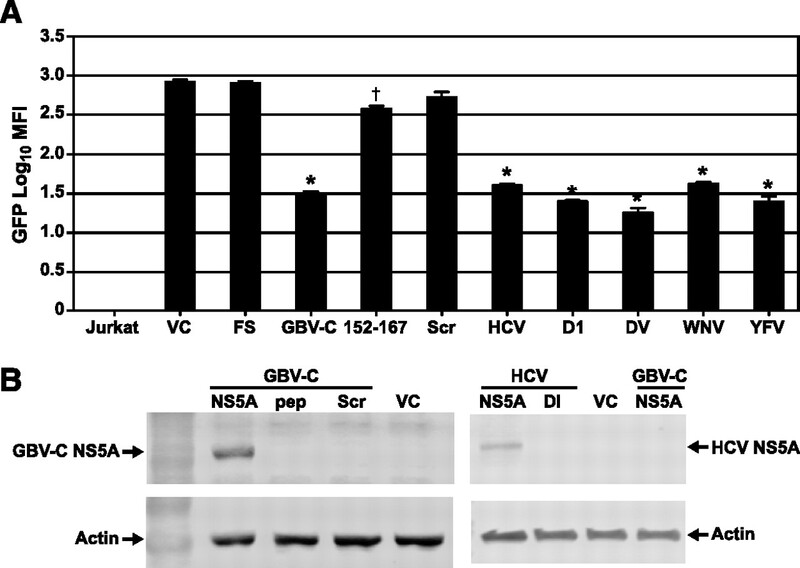 GBV-C and HCV NS5A effects on cell surface receptor expression. GBV-C and HCV NS5A proteins did not decrease the expression of another cell surface receptor (CD81) on Jurkat cells compared with the VC (MFI in parentheses; A). However, CD4 expression was decreased in primary human CD4-enriched T cells transiently expressing these NS5A proteins (B). Data represent CD4 MFI 48 h after transfection compared with VC cells (B; ∗, p < 0.001; †, p = 0.014). Jurkat and MT-2 (CD4+ T cell) cell lines, primary human CD4+ T cells, and macrophages were infected with YFV with or without HIV superinfection. YFV replication in these cells was confirmed by measuring YFV RNA and by the release of infectious particles into culture supernatants. HIV replication was completely blocked by YFV infection in both T cell lines (Jurkat cell data shown in Fig. 7⇓A). This was confirmed in MT-2 cells by a block of HIV-induced syncytia induction (Fig. 7⇓B) and by measuring HIV protein synthesis in cells with or without YFV infection. 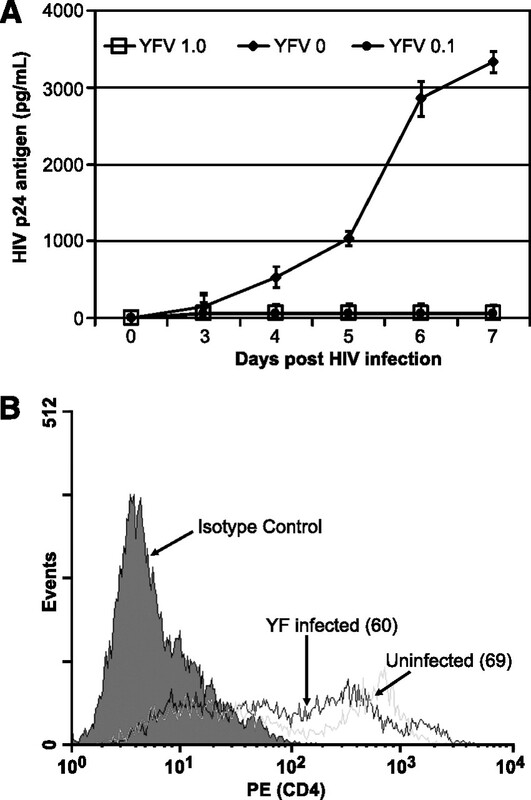 YFV infection was initiated 24 h before HIV inoculation (Fig. 7⇓C). YFV (vaccine strain) infection inhibits HIV replication in a human CD4+ T cell line. YFV was applied to Jurkat cells 24 h before the addition of HIV and HIV replication was assessed by HIV p24 Ag release into culture medium (A). The MOI of YFV is shown (mock infection = 0, YFV range = 0.01–1.0 infectious units/cell). YFV infection (MOI, 1.0) of MT-2 cells 24 h before HIV infection blocked HIV-induced syncytia formation (B). NC, Negative control (YFV MOI, 0). HIV envelope protein expression (gp120, gp160) was reduced by YFV infection as measured by immunoblot analysis (C). MOI, 0.01, 0.1, and 1. YFV infection of primary human PBMCs also resulted in the inhibition of both CCR5- and CXCR4-tropic HIV isolates (Fig. 8⇓, A and B). 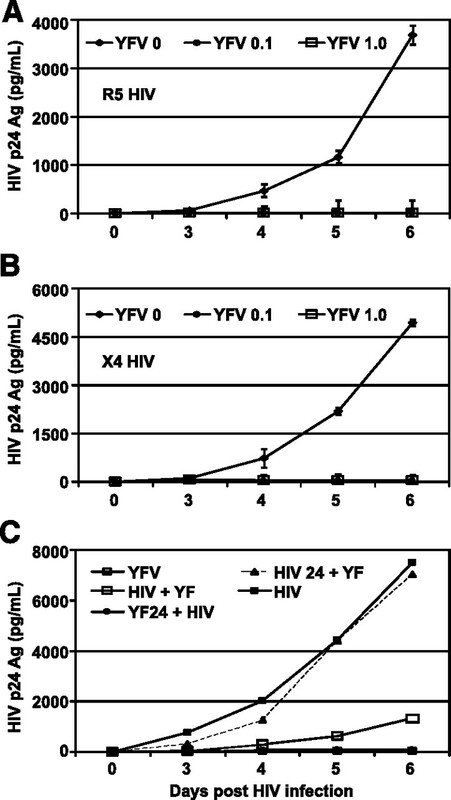 The timing of YFV and HIV infection was important, since YFV infection did not inhibit HIV replication if HIV infection was initiated 24 h before YFV, and more limited inhibition occurred when YFV and HIV infection were initiated simultaneously compared with when YFV preceded HIV infection by 24 h (Fig. 8⇓C). YFV infection did not inhibit mumps virus infection, even when mumps virus inoculation was initiated 24 h after YFV in either MT-2 cells or PBMCs (data not shown). YFV replication was required for the effect, since UV-inactivated YFV failed to inhibit HIV replication (data not shown). YFV inhibits HIV in primary human T cells. YFV (vaccine strain) was used to infect primary human PBMCs (MOI, 0 (mock infection control), 0.1, and 1) 24 h before infection with CCR5-tropic (R5; A) or CXCR4-tropic (X4; B) HIV isolates and HIV replication was measured by release of p24 Ag into culture supernatant. Inhibition of an X4 HIV isolate occurred when YFV was applied 24 h before (YF24 + HIV) or simultaneously with HIV (HIV + YF), but not with HIV alone (HIV) or if HIV infection preceded YFV by 24 h (HIV24 + YF; C). YF, YFV infection only, no HIV infection. YFV replication reduced steady-state CD4 mRNA levels (data not shown), and CD4 surface expression on MT-2 cells (Fig. 9⇓A) and in primary human CD4+ T cells measured 4 days after infection (Fig. 9⇓B). CD4 modulation was specific for YFV infection, as mumps virus infection did not reduce CD4 expression on MT-2 cells (Fig. 9⇓C). YFV infection resulted in decreased surface expression of CXCR4 on MT-2 cells, primary PHA-IL-2-stimulated CD4+ T cells, and MDMs compared with uninfected control cells (supplemental Fig. 3B). Mumps virus infection did not down-regulate CXCR4 in MT-2 cells, and YFV infection decreased CCR5 surface expression on PHA-IL2-stimulated primary CD4+ T cells (supplemental Fig. 3B). YFV infection did not decrease cell viability of primary or transformed CD4 cells compared with uninfected control cells. Unexpectedly, YFV infection induced proliferation of CD4 cells cultured without PHA and IL-2 and did not promote CD4 cell death (supplemental Fig. 4). Thus, the effects of YFV infection on HIV replication did not appear to be due to cellular toxicity. YFV infection down-regulates CD4 expression on human CD4+ T cells. 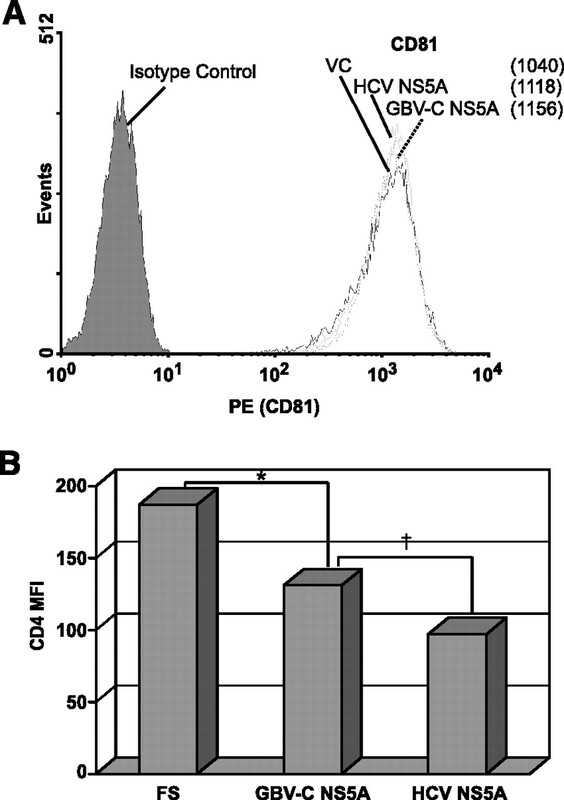 YFV infection decreased the CD4 surface density on MT-2 cells (A) and primary human peripheral blood T cells (B) 48 h after infection in a dose-dependent manner. The MFI for each experiment is shown in parentheses. NC, Negative control. In contrast, mumps virus infection did not alter CD4 surface density 48 h after infection in MT-2 cells (C). Human MDMs express CD4 and CCR5 and are permissive for R5-tropic HIV infection (36). In addition, macrophages are reported to be permissive for YFV infection (37), as well as DV (38), WNV (39), and HCV (40). YFV infection of primary human MDMs 24 h before HIV infection significantly and potently inhibited HIV replication (p < 0.001; Fig. 10⇓A) and led to significant down-regulation of CD4 surface expression (p = 0.021; Fig. 10⇓B), indicating that the effect on CD4 expression is not limited to T cells. YFV replication was documented in the MDMs by infectivity and viral RNA determination in culture supernatants (data not shown). Similar to YFV effects on PBMCs, YFV infection of macrophages did not result in a reduction in viable MT-2 cells or MDMs. YFV inhibits HIV and down-regulates CD4 expression in human MDMs. YFV infection of primary human MDMs was initiated 2 days after differentiation (MOI, 0 (mock control), 0.1, and 1) and HIV infection was initiated 1 day later. HIV release into culture supernatants is shown in A. CD4 expression on MDMs was determined 7 days after YFV or mock-control infection by flow cytometry (B). The MFI for each experiment is shown in parentheses. Background fluorescence of YFV-infected cells using an isotype control Ab is shown. Expression of the NS5 protein of five different members of the Flaviviridae decreased CD4 expression in a CD4+ T cell line and in primary CD4+ T cells with resultant inhibition of HIV replication (Figs. 2–3⇑⇑). Although CD4+ T cells are not the primary target for DV, WNV, YFV, or HCV, evidence suggests that all of these viruses infect these cells (14, 15, 16, 41, 42, 43, 44, 45, 46). In contrast, human T and B cells are permissive for GBV-C and appear to be the primary site of viral replication (16). The mechanism of flavivirus NS5 protein-mediated CD4 regulation appears to be at the transcriptional level, as NS5 protein expression in T cells reduces steady-state CD4 mRNA levels compared with the VC cells. CD4 levels were also reduced during YFV infection in lymphocytes, even when infection was performed at a low multiplicity of infection (MOI). Monocytes and MDMs are thought to be a primary target of YFV infection, and these cells are permissive for YFV (47), DV (38), WNV (39), and HCV (40) in vitro. We found that YFV infection led to decreased CD4 expression and inhibited HIV replication in macrophages as well as in CD4+ T cells (Fig. 10⇑). Since YFV had a profound effect on HIV replication even at a low MOI, it suggests that the effects of YFV infection extend beyond CD4 modulation and studies are underway to further characterize the kinetics and extent of these interactions. As predicted, down-regulation of CD4 neither inhibited mumps virus infection, nor did mumps virus infection modulate CD4 expression (Figs. 3⇑C and 9⇑C). CD4 is a type I transmembrane glycoprotein expressed on a subset of T lymphocytes and on cells of the macrophage/monocyte lineage, and it is the binding receptor for the HIV envelope protein gp120 (48, 49, 50). CD4-bearing T cells recognize Ags presented by MHC class II molecules on APCs, triggering immune responses including the activation of B cells and recruitment of phagocytes (48). CD4 also serves as a coreceptor for the TCR, amplifying the TCR signal by recruiting the tyrosine kinase lck, which is an essential step in the signaling cascades of activated T cells and a prerequisite for T cell proliferation (48). Thus, in addition to decreasing HIV binding and entry, down-regulation of CD4 will impair helper T cell function and potentially delay or prevent the development of adaptive immune responses. These effects potentially contribute to persistent infection for HCV and GBV-C.
HIV replication is highly dependent upon T cell proliferation and activation and CD4 activation is a key factor in HIV pathogenesis (reviewed in Refs. 51, 52). Down-regulation of CD4 by flaviviruses may also attenuate HIV pathogenesis by decreasing either the TCR signal required for activation or by lowering the threshold of the TCR signal. Consistent with the latter hypothesis, a previous study found decreased surface expression of cell surface activation markers (CD38 and CCR5) on CD4 and CD8 T cells in GBV-C and HIV-coinfected individuals compared with people infected with HIV alone (21), and GBV-C infected individuals have blunted CD4 proliferation in response to IL-2 therapy (53). In addition to flaviviruses, infection with HIV (54), human herpesvirus 7 (55), and a rabbit pox virus (56) decreases CD4 surface expression on lymphocytes. Although the mechanisms of down-regulation are incompletely understood, specific HIV proteins reduce CD4 expression (Nef, vpu, gp120) and similar to our findings with flavivirus NS5 protein, HIV gp120 reduces steady-state CD4 mRNA levels (54). CD4 down-modulation has not previously been described among the Flaviviridae, yet the NS5 protein of all five human flaviviruses studied significantly decreased CD4 mRNA and protein expression. The finding that flaviviruses modulate CD4 expression suggests that this may be a mechanism by which these viruses evade host immune recognition. In addition, this effect may contribute to viral persistence for HCV and GBV-C.
CD4 modulation appeared to be the most significant for GBV-C NS5A; however, this may reflect differences in NS5A expression levels, as quantitative protein expression levels cannot be directly compared for the different constructs. Nevertheless, CD4 down-regulation required only 16 aa within the GBV-C NS5A protein (Fig. 4⇑) and previous studies found that incubation of cells with the GBV-C peptide inhibits HIV replication (25). Since there is <30% amino acid sequence identity between the GBV-C NS5A peptide and the HCV DI or DV, WNV, or YFV NS5 sequences, it appears that the HIV CD4 modulatory effect is mediated by a structural element that is conserved among these viruses. Studies are underway to further characterize the peptide domains that down-regulate CD4 expression in these viruses and to identify the intracellular binding partners of these proteins. Generation of structural mimics of these peptides may lead to novel, cellular-based therapeutics designed to modulate CD4 expression, which may have a role in a variety of infectious and immune-based diseases. We thank Drs. Steven Polyak (University of Washington, Seattle, WA), Alan Rothman (University of Massachusetts, Worcester, MA), and Andrew Dayton (U.S. Food and Drug Administration, Bethesda, MD) and Charles Rice (The Rockefeller University, New York, NY) and Catherine Patterson (Case Western University, Cleveland, OH), respectively, for providing cDNA containing HCV, DV (serotype 2), YFV (17D), and WNV NS5 coding sequences. We also thank Dr. Peter Simmonds (University of Edinburgh, Edinburgh, U.K.) for advice related to sequence alignments and Drs. William Nauseef and Stanley Perlman (University of Iowa, Iowa City, IA) for critical review of this manuscript. The University of Iowa Flow Cytometry and DNA Core Facilities were used for flow cytometry and DNA sequence analyses. Drs. J. Xiang and J. T. Stapleton hold a patent (U.S. Patent No. 7,291,723) on the use of GBV-C as a therapeutic modality for HIV and Drs. J. Xiang, J. M. McLinden, and J. T. Stapleton have a patent application pending related to the use of flavivirus NS5 protein as an anti-HIV therapy. ↵1 This research was supported in part by a Merit Review grant from the Department of Veterans Affairs, Veterans Health Administration, Office of Research and Development (to J.X. and J.T.S. ), a grant from the National Institutes of Health (R01 AI-58740; to J.T.S. ), and a pilot grant from the University of Iowa National Institutes of Health Clinical & Translational Sciences Program UL1 RR024979 (to J.T.S.). ↵3 Abbreviations used in this paper: HCV, hepatitis C virus; GBV-C, GB virus type C; DV, dengue virus; SDF-1, stem cell-derived factor 1; YFV, yellow fever virus; IRES, internal ribosomal entry site; MDM, monocyte-derived macrophage; WNV, West Nile virus; GT, genotype; Scr, scrambled order; DI, domain I; VC, vector control; FS, frameshift; MOI, multiplicity of infection; MFI, mean fluorescent intensity; EMC, encephalomyocarditis virus. Calisher, C. H., E. A. Gould. 2003. Taxonomy of the virus family Flaviviridae. Adv. Virus Res. 59: 1-19. Lindenbach, B. D., C. M. Rice. 2003. Molecular biology of flaviviruses. Adv. Virus Res. 59: 23-61. Stapleton, J. T.. 2003. GB virus type C/hepatitis G virus. Semin. Liver Dis. 23: 137-148. Moradpour, D., F. Penin, C. M. Rice. 2007. Replication of hepatitis C virus. Nat. Rev. Mircrobiol. 5: 453-463. Macdonald, A., M. Harris. 2004. Hepatitis C virus NS5A: tales of a promiscuous protein. J. Gen. Virol. 85: 2485-2502. Alter, H. J.. 1997. G-pers creepers, where’d you get those papers? A reassessment of the literature on the hepatitis G virus. Transfusion 37: 569-572. Heringlake, S., J. Ockenga, H. L. Tillmann, C. Trautwein, D. Meissner, M. Stoll, J. Hunt, C. Jou, N. Solomon, R. E. Schmidt, M. P. Manns. 1998. GB Virus C/hepatitis G virus infection: a favorable prognostic factor in human immunodeficiency virus-infected patients?. J. Infect. Dis. 177: 1723-1726. Toyoda, H., Y. Fukuda, T. Hayakawa, J. Takamatsu, H. Saito. 1998. Effect of GB virus C/hepatitis G virus coinfection on the course of HIV infection in hemophilia patients in Japan. J. Acquir. Immune Defic. Syndr. 17: 209-213. Tillmann, H. L., H. Heiken, A. Knapik-Botor, S. Heringlake, J. Ockenga, J. C. Wilber, B. Goergen, J. Detmer, M. P. Manns, M. Stoll, R. E. Schmidt, M. P. Manns. 2001. Infection with GB virus C and reduced mortality among HIV-infected patients. N. Engl. J. Med. 345: 715-724. Xiang, J., S. Wunschmann, D. J. Diekema, D. Klinzman, K. D. Patrick, S. L. George, J. T. Stapleton. 2001. Effect of coinfection with GB Virus C (hepatitis G virus) on survival among patients with HIV infection. N. Engl. J. Med. 345: 707-714. Williams, C. F., D. Klinzman, T. E. Yamashita, J. Xiang, P. M. Polgreen, C. Rinaldo, C. Liu, J. Phair, J. B. Margolick, D. Zdunek, G. Hess, J. T. Stapleton. 2004. Persistent GB virus C infection and survival in HIV-infected men. N. Engl. J. Med. 350: 981-990. Van der Bij, A. K., N. Kloosterboer, M. Prins, B. Boeser-Nunnink, R. B. Geskus, J. M. A. Lange, R. A. Coutinho, H. Schuitemaker. 2005. GB Virus C coinfection and HIV-1 disease progression: The Amsterdam cohort study. J. Infect. Dis. 191: 678-685. Zhang, W., K. Chaloner, H. L. Tillmann, C. F. Williams, J. T. Stapleton. 2006. Effect of early and late GBV-C viremia on survival of HIV infected individuals: A meta-analysis. HIV Med. 7: 173-180. Fogeda, M., S. Navas, J. Martin, M. Casqueiro, E. Rodriguez, C. Arocena, V. Carreno. 1999. In vitro infection of human peripheral blood mononuclear cells by GB virus C/hepatitis G virus. J. Virol. 73: 4052-4061. Xiang, J., S. Wunschmann, W. N. Schmidt, J. Shao, J. T. Stapleton. 2000. Full-length GB virus C (hepatitis G virus) RNA transcripts are infectious in primary CD4-positive T cells. J. Virol. 74: 9125-9133. George, S. L., D. Varmaz, J. T. Stapleton. 2006. GB virus C replicates in primary T and B lymphocytes. J. Infect. Dis. 193: 451-454. Xiang, J., S. L. George, S. Wunschmann, Q. Chang, D. Klinzman, J. T. Stapleton. 2004. Inhibition of HIV-1 replication by GB virus C infection through increases in RANTES, MIP-1α, MIP-1β, and SDF-1. Lancet 363: 2040-2046. Jung, S., O. Knauer, N. Donhauser, M. Eichenmuller, M. Helm, B. Fleckenstein, H. Reil. 2005. Inhibition of HIV strains by GB virus C in cell culture can be mediated by CD4 and CD8 T-lymphocyte derived soluble factors. AIDS 19: 1267-1272. Xiang, J., M. A. Sathar, J. H. McLinden, D. Klinzman, Q. Chang, J. T. Stapleton. 2005. 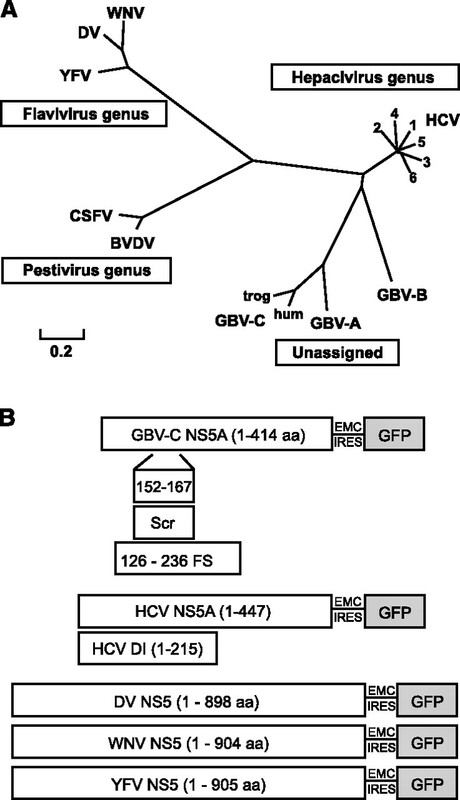 South African GB virus C isolates: interactions between genotypes 1 and 5 GBV-C isolates and the human immunodeficiency virus. J. Infect. Dis. 192: 2147-2151. Watt, G., P. Kantipong, K. Jongsakul. 2003. Decrease in human immunodeficiency virus type 1 load during acute dengue fever. Clin. Infect. Dis. 36: 1067-1069. Nattermann, J., H. D. Nischalke, B. Kupfer, J. Rockstroh, L. Hess, T. Sauerbruch, U. Spengler. 2003. Regulation of CC chemokine receptor 5 in hepatitis G virus infection. AIDS 17: 1457-1462. Jung, S., M. Eichenmueller, N. Donhauser, F. Neipel, A. M. Engel, G. Hess, B. Fleckenstein, H. Reil. 2007. HIV entry inhibition by the envelope 2 glycoprotein of GB virus C. AIDS 21: 645-647. Xiang, J., J. H. McLinden, Q. Chang, T. M. Kaufman, J. T. Stapleton. 2006. An 85 amino acid segment of the GB virus type C NS5A phosphoprotein inhibits HIV-1 replication in CD4+ Jurkat T-cells. Proc. Natl. Acad. Sci. USA 103: 15570-15575. Chang, Q., J. H. McLinden, J. T. Stapleton, M. A. Sathar, J. Xiang. 2007. GB virus C NS5A protein from genotypes 1, 2, 3, and 5 and a 30 amino acid NS5A fragment expression inhibit HIV-1 replication in a CD4+ T-lymphocytes. J. Gen. Virol. 88: 3341-3346. McLinden, J. H., J. T. Stapleton, Q. Chang, J. Xiang. 2008. Expression of the dengue virus type 2 NS5 protein in a CD4+ T cell line inhibits HIV replication. J. Infect. Dis. 198: 860-863. Xiang, J., C. Martinez-Smith, M. Gale, Jr, D. R. LaBrecque, W. N. Schmidt, J. T. Stapleton. 2005. GB virus C NS5A sequence polymorphisms: association with interferon susceptibility and inhibition of PKR-mediated eIF-2α phosphorylation. J. Interferon Cytokine Res. 25: 261-270. Schelsinger, L. S., S. R. Hurr, T. M. Kaufman. 1994. Binding of the terminal mannosyl units of lipoarabinomannan from a virulent strain of Mycobacterium tuberculosis to human macrophages. J. Immunol. 152: 4070-4079. Sakata, H., M. Hishiyama, A. Sugiura. 1984. Enzyme-linked immunosorbent assay compared with neutralization tests for evaluation of live mumps vaccines. J. Clin. Microbiol. 19: 21-25. Litwin, J.. 1964. Growth of 17D yellow fever virus and factors influencing its transmission within cell cultures in vitro. Acta Pathol. Microbiol. Scand. 61: 605-618. Cook, R. T., J. T. Stapleton, D. Klinzman, Z. K. Ballas. 1997. Effect of a single ethanol ingestion on lymphocyte subsets and in vitro HIV replication. J. Invest. Med. 45: 265-271. Kumar, S., D. Tan, M. Nei. 2004. MEGA3: Integrated software for molecular evolutionary genetics analysis and sequence alignment. Briefings Bioinform. 5: 150-163. Koonin, E. V.. 1991. The phylogeny of RNA-dependent RNA polymerases of positive-strand RNA viruses. J. Gen. Virol. 72: 2197-2206. Yu, Y., A. J. Annala, J. R. Barrios, T. Toyokuni, N. Satyamurthy, M. Namavari, S. R. Cherry, M. E. Phelps, H. R. Herschman, S. S. Gambhir. 2008. Quantification of target gene expression by imaging reporter gene expression in living animals. Nat. Med. 6: 933-937. Tellinghuisen, T. L., J. Marcotrigiano, A. E. Gorbalenya, C. M. Rice. 2004. The NS5A protein of hepatitis C virus is a zinc metalloprotein. J. Biol. Chem. 279: 48576-48687. Gartner, S., P. Markovits, D. M. Markovits, M. H. Kaplan, R. C. Gallo, M. Popovic. 1986. The role of mononuclear phagocytes in HTLV-III/LAV infection. Science 233: 215-219. Blackley, S., Z. Kou, H. Chen, M. Quinn, R. C. Rose, J. J. Schlesinger, M. Coppage, X. Jin. 2007. Primary human splenic macrophages, but not T or B cells, are the principal target cells for dengue virus infection in vitro. J. Virol. 81: 13325-13334. Rios, M., M. J. Zhang, A. Grinev, K. Srinivasan, D. Daniel, O. Wood, I. K. Hewlett, A. I. Dayton. 2006. Monocytes-macrophages are a potential target in human infection with West Nile virus through blood transfusion. Transfusion 46: 659-667. Laskus, T., M. Radkowski, J. Jablonska, K. Kibler, J. Wilkinson, D. Adair, J. Rakela. 2004. Human immunodeficiency virus facilitates infection/replication of hepatitis C virus in native human macrophages. Blood 103: 3854-3859. Mentor, N. A., I. Kurane. 1997. Dengue virus infection of human T lymphocytes. Acta Virol. 41: 175-176. Denman, A. M., B. Rager-Zisman, T. C. Merigan, D. A. Tyrell. 1974. Replication or inactivation of different viruses by human lymphocyte preparations. Infect. Immun. 9: 373-376. Garcia-Tapia, D., C. M. Loiacono, S. B. Kleiboeker. 2006. Replication of West Nile virus in equine peripheral blood mononuclear cells. Vet. Immunol. Immunopathol. 110: 229-244. Laskus, T., M. Radkowski, L. F. Wang, S. J. Jang, H. Vargas, J. Rakela. 1998. Hepatitis C virus quasispecies in patients infected with HIV-1: correlation with extrahepatic replication. Virology 248: 164-171. Kondo, Y., V. M. Sung, K. Machida, M. Liu, M. M. Lai. 2007. Hepatitis C virus infects T cells and affects interferon-γ signaling in T cell lines. Virology 361: 161-173. Lin, Y. W., K. J. Wang, H. Y. Lei, Y. S. Lin, T. M. Yeh, H. S. Liu, C. C. Liu, S. H. Chen. 2002. Virus replication and cytokine production in dengue virus-infected human B lymphocytes. J. Virol. 76: 12242-12249. Schlesinger, J. J., M. W. Brandriss. 1981. Antibody-mediated infection of macrophages and macrophage-like cell lines with 17D-yellow fever virus. J. Med. Virol. 8: 103-117. Miceli, M. C., J. R. Parnes. 1993. Role of CD4 and CD8 in T cell activation and differentiation. Adv. Immunol. 53: 59-122. Dalgleish, A. G., P. C. L. Beverley, P. R. Clapham, D. H. Crawford, M. F. Greaves, R. A. Weiss. 1984. The CD4 (T4) antigen is an essential component of the receptor for human retrovirus LAV. Nature 312: 763-767. Bowers, K., C. Pitcher, M. Marsh. 1997. CD4: a coreceptor in the immune response and HIV infection. Int. J. Biochem. Cell Biol. 29: 871-875. Douek, D. C.. 2003. Disrupting T-cell homeostasis: how HIV-1 infection causes disease. AIDS Rev. 5: 172-177. Douek, D. C.. 2007. HIV disease progression: immune activation, microbes, and a leaky gut. Top. HIV Med. 15: 114-117. Stapleton, J. T., K. Chaloner, J. Zhang, D. Klinzman, I. E. Souza, J. Xiang, A. Landay, J. Fahey, R. Pollard, R. Mitsuyasu. 2008. GB virus C viremia is associated with reduced CD4 expansion following interleukin 2 therapy in HIV-infected people receiving HAART. AIDS 23: 605-610. Hoxie, J. A., J. D. Alpers, J. L. Rackowski, K. Huebner, B. S. Haggarty, A. J. Cedarbaum, J. C. Reed. 1986. Alterations in T4 (CD4) protein and mRNA synthesis in cells infected with HIV. Science 234: 1123-1127. Lisco, A., J. C. Grivel, A. Biancotto, C. Vanpoulle, F. Origgi, M. S. Malnati, D. Schols, P. Lusso, L. B. Margolis. 2007. Viral interactions in human lymphoid tissue: human herpesvirus 7 suppresses the replication of CCR5-tropic human immunodeficiency virus type 1 via CD4 modulation. J. Virol. 81: 708-717. Barry, M., S. F. Lee, L. Boshkov, G. McFadden. 1995. Myxoma virus induces extensive CD4 downregulation and dissociation of p56lck in infected rabbit CD4+ T lymphocytes. Virology 69: 5243-5251.